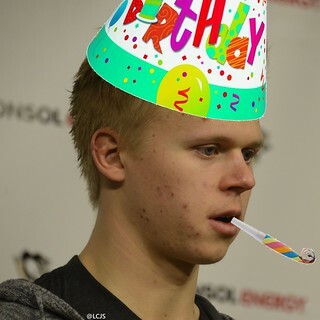 Today is Olli Maatta’s 21st birthday. Back in January, the Pittsburgh Penguins lost an extremely valuable piece to their puzzle when defensemen Maatta had surgery on his shoulder. He was returning from previous surgery on that same shoulder, and had played 20 games to that point in the season. After this past off season when the Pens decided to go with more of a “youth movement” on defense, Maatta is going to have a huge part to play on the future of this team. Besides the two elder statesmen of Rob Scuderi and newly re-acquired (on a tryout contract) Sergei Gonchar, what you have is a dearth of experience behind superstar Kris Letang. Yes, Ben Lovejoy is 31 – but the team doesn’t hinge on his play. Ian Cole, on a fresh, new contract is the most experienced at age 26. Tim Erixon at 24 is the next one down the line age wise. After that, Brian Dumoulin, Adam Clendening, and Derrick Pouliot are all old enough to drink, but not by much. That leaves us with young Maatta, who already has served decent time in the NHL. It’s as impossible to predict good health as it is to ignore poor health. If the Pens are going to have a successful year, a lot rides on the health of this Finnish defensmen’s shoulders. When Maatta was drafted 22nd overall in the 2012 NHL Draft, it was thought that the Pens were guilty of larceny. They had already taken Pouliot earlier in the round (8th overall) after acquiring the Carolina Hurricanes pick in the Jordan Staal / Brandon Sutter deal. Commentators were shocked that Maatta had lasted that long, being projected more towards where Pouliot was. That the Pens somehow walked away from that draft with two budding stars on defense spoke to the team’s commitment towards over-drafting puck-moving defensemen. In this instance, job well done. Maatta burst onto the scene and earned a spot on the roster during his first season with the big club, playing in 78 games and chipping in with just under 30 points. He was also a +8, which speaks to the poise of someone so young. Heading into last season, Maatta’s name was being mentioned after Letang as to the roster’s pecking order – until his season ended prematurely. Now eight months later, Maatta is ready to hit the ice again. Will he be able to step right back into his former role or will he come out rusty and need some time to acclimate? Judging by his play after his last return from injury, it may take some time. Maatta scored 7.6 percent of the time he shot the puck during his rookie campaign. In the 20 games he played last season, he found the back of the net at only a 3.6 percent pace. It’s understandable that the injury effected his play, and a slow start to the season could indicate he’s not completely over his shoulder troubles. At 21, Maatta has lots of time career-wise to return to form; but if the Pens are really going to take that next step this season, he has got to play a big role in carrying some of the load.